Ocean acidification describes the chemical changes that occur as seawater reacts with excess carbon dioxide absorbed from the atmosphere. Key changes in the carbonate chemistry of seawater during acidification include an increase in the partial pressure of CO2, increased acidity (reduced ocean pH), and reduced levels of carbonate ions (CO32-). These chemical changes can be physiologically challenging for organisms, disrupting their internal acid-base balance and impairing calcification of shells or skeletons, ultimately increasing the "cost of living" to cope with higher ocean carbon levels. For some organisms, particularly some marine plants, increased CO2 levels can actually enhance growth, but for many organisms, the increased CO2 can impair behavior, growth, reproduction, survival, and other life processes. 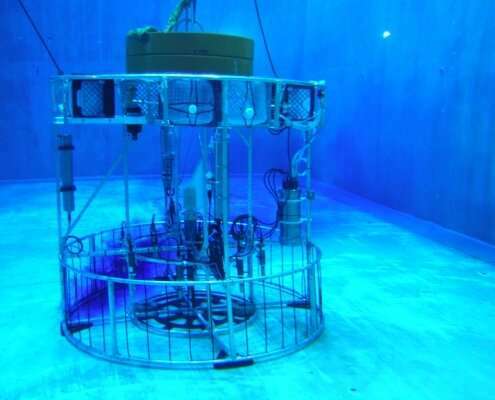 Floating in the clear blue waters of an indoor test tank, MBARI's first Free Ocean CO2 Enrichment (FOCE) system was a circular cage of pipes intended to drench the area inside with water rich in carbon dioxide (CO2). Inspired by an approach to study the effects of rising CO2 levels on land called Free-Air CO2 Enrichment (FACE) experiments, FOCE was designed to answer a critical question—how do increasing levels of carbon dioxide in the ocean affect marine plants and animals? The FOCE system attempts to provide researchers with the ability to precisely manipulate experimental conditions while incorporating the complexities and variability of a natural community. As the researchers wrote in their recent paper, "These advantages make FOCE an ideal approach to help address current gaps in understanding of ocean acidification impacts, including long-term and multi-stressor effects." 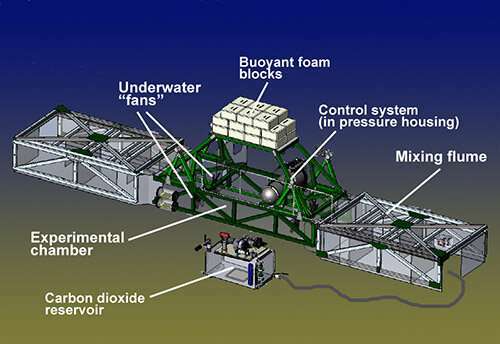 Over a decade after its initial test in MBARI's indoor test tank, the FOCE system has evolved into a powerful and versatile tool that is being used globally to expand our knowledge of ocean acidification and how oceanic ecosystems may react to future conditions. This ability to perform long-term ocean acidification experiments on whole marine communities has revealed new, unexpected findings that have challenged what scientists thought they knew, and sparked more questions that need to be explored. 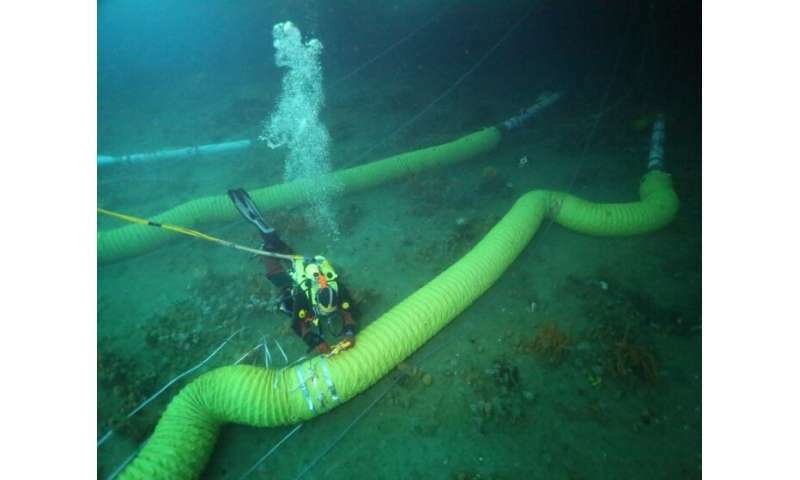 In Monterey Bay, the first deep-water FOCE experiment showed how changes in pH can affect the foraging behavior and movement of deep-sea urchins. During this experiment, MBARI researchers used a series of "raceways" to track the foraging ability of individual sea urchins at different pH levels. Like many experimental systems, the FOCE design has weaknesses. 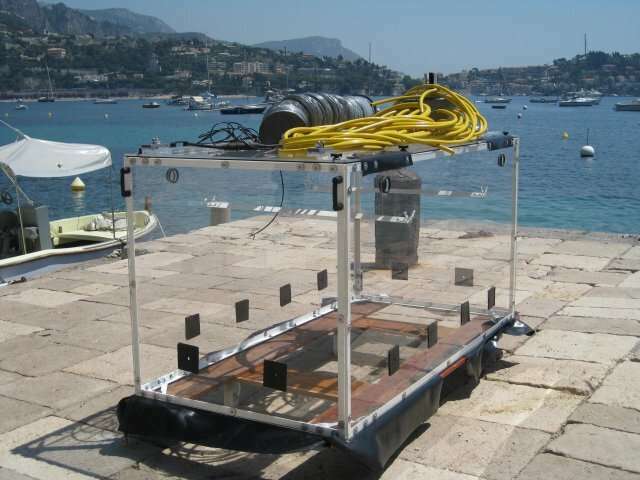 For example, because study plots must be enclosed in partially-open (flow-through) enclosures to help control seawater chemistry, the conditions experienced by study organisms inside FOCE enclosures are somewhat different from the natural environment nearby. Seawater flowing through these enclosures is enriched in CO2, but keeps normal levels of plankton and varies in temperature and most other factors just as in study plots outside FOCE chambers. Other factors, such as currents or light levels may be diminished within chambers, compared to areas outside FOCE chambers. Researchers have responded to this concern by including "control" plots within FOCE enclosures that do not experience acidification, as well as open plots outside chambers. 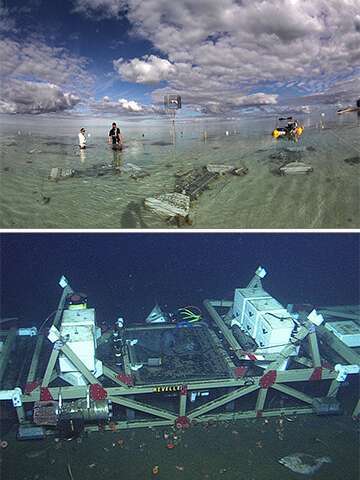 "The next generation of FOCE experiments ideally would include increased replication, longer experiments to encompass multi-generational times for benthic species and whole and multiple season cycles, multiple environmental-factor approaches, and the use of ancillary incubation chambers for examination of short-term physiological and behavioral responses," the researchers suggest in their paper. In summary, FOCE systems are an indispensable tool to view the impacts of a changing ocean on whole ecosystems. As the researchers put it, "The knowledge gained from further FOCE experiments would make an important contribution to improving our ability to forecast the impacts of ocean acidification on natural ecosystems and to better support the management of its impacts."